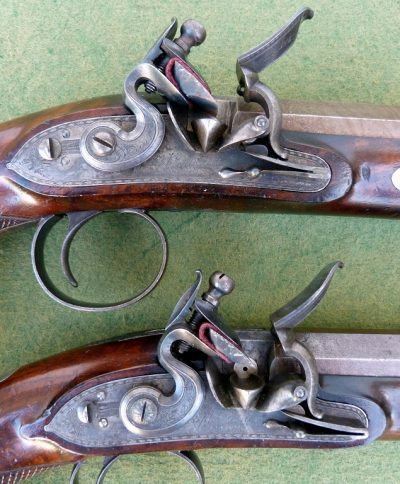 With 10 inch octagonal twist sighted barrels retaining their original brown and marked CL for Charles Lancaster, case hardened patent breeches with platinum lined maker’s stamp, platinum line and touch hole, tangs finely engraved incorporating the rear sights, signed bolted detented locks with rainproof pans and roller frizzens, the steels each signed “Joseph Manton Patent” and numbered 4756 and 4757 respectively, figured walnut half stocks with finely chequered butts, horn foreend caps and silver wrist escutcheons engraved with the owner’s crest, original horn tipped ramrods, both pistols retaining much original case hardened and blued finish; in their original lined and fitted mahogany case with accessories including red leather covered three way flask, serial numbered ball mould, turn screw and loading rod. Literature: W. Keith Neal & D.H.L. Back, “The Mantons” p. 247.